In a recent article in Risk Analysis, Park and several colleagues argue that recent disasters such as Hurricane Katrina, the Deepwater Horizon oil spill, and the crisis at the Fukushima nuclear power plant have renewed interest in “resilience” in system design. I strongly recommend this article to readers, as it offers an interesting take on catastrophe management and mitigation from the perspective of systems engineering (systems engineering is concerned with managing complex systems throughout their life cycles – including during crises; when the concept is applied to communities [i.e. understanding a community as a system], a system engineer seeks to plan for the community in such a way that it fails minimally and recovers quickly). One thing that is of particular interest to our readers is their argument regarding the engineering mindset, and its relevance to “resilience” versus traditional hazard mitigation approaches. In the words of Park et al., engineers tend to look for “problems to be solved rather than conditions to be managed” (2013, 360). While the engineering mindset is clearly crucial to disaster preparation and response, it is not necessarily (or always) the best, and certainly not the only mode of response. That is, the engineering mindset is useful and important, but it should not animate the sole voice in any design or response situation, including disaster situations. Resilience is typically defined as “the capacity to adapt to changing conditions without catastrophic loss of form or function” (pp. 356). Park and colleagues argue, however, that resilience is not a property that system has or lacks (as the preceding definition suggests), rather, they suggest that resilience is an emergent property – an “outcome of a recursive process that includes: sensing, anticipation, learning, and adaptation” (pp. 356). That is, resilience is a dynamic property like risk itself, a function of the system. Resilience derives from the basic elements of a system, and the interplay between those elements. Thus argue Park et al., systems (whether a household, a bridge, a city, etc.) should be engineered not to be disaster-proof, but rather to survive and effectively weather a disaster (think fail-safe versus safe-fail; a “fail-safe system is one that can never fail, a safe-fail system is one designed to fail safely (as opposed to catastrophically) in the event of a failure). A resiliency-oriented system, then, is one whose designers recognize that it is genuinely impossible to build something that is truly fail-safe, or “disaster-proof”, and to instead emphasize the importance of designing and building systems that can fail without imposing massive harm to people or infrastructure. I’ll try to clarify with an example of the “engineering mindset” from research conducted by the editors of this blog (and published here, if you’re interested in reading further) [note that this is a military-engineering mindset, not a perfect representation of the presumptive “typical” engineering mindset]. In post-Katrina New Orleans, the Army Corps of Engineers was tasked with cleaning up debris in wrecked portions of the city (the Corps had many tasks, this was only one of them). The Corps pursued this objective with vigor that one would expect from a militarized bureaucracy. Unfortunately, in their haste to fulfill their demolition mission, the Corps ran roughshod over citizens’ due process and property rights, routinely violated its own administrative procedures, and consequently demolished a large number of homes before home owners were able to make any claims as to whether they were actually so badly damaged that they actually need to be demolished. Many property owners claimed that their homes or businesses should never have been destroyed – and some were destroyed before the owners were allowed to return to the city to view the damage. The Corps claimed that the work was necessary for the health and safety of people of New Orleans. Unfortunately, the work was done so quickly that we’ll never know which of these claims is true (or how true each is). For these and similar reasons, the Corps was subject to numerous lawsuits from citizens and activists seeking relief from the Corps’ ardor for its task. 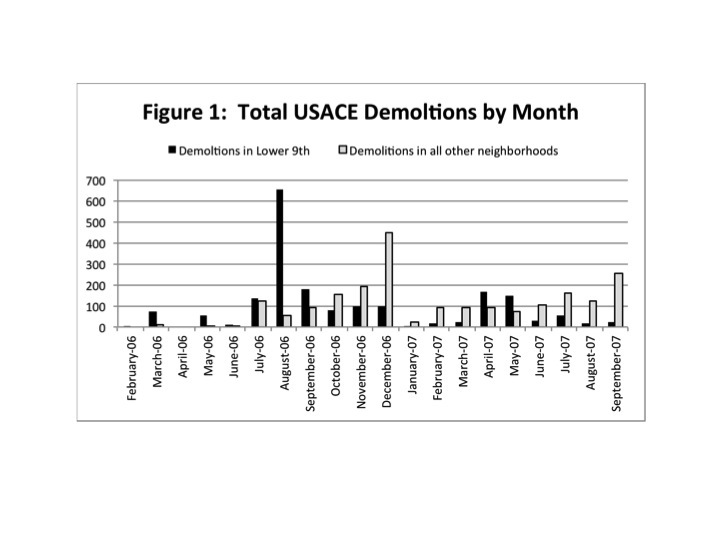 Figure 1 shows the number of demolitions conducted in the Lower 9th Ward (black bar) as compared to the total number of demolitions conducted in all other neighborhoods combined (gray bar). The data presented cover all months from February of 2006 through September of 2007. This is not intended to disparage the Corps, per se, but rather to point out that engineers, including the Corps, also create unintended consequences with their laser-like foci on “solving problems.” In post-New Orleans the Corps could have avoided some major headaches by slowing down, thinking about due process and property rights issues, the importance of community in places like the Lower 9th Ward, and so (not only would they have avoided violating peoples’ rights, they also would have obviated more than a few lawsuits). This example is a modest departure from the core concepts I’m discussing here. In physical terms, the New Orleans flood-protection system was theoretically engineered to protect the city from a direct hit from a hurricane; for many well-documented reasons, that system failed. In reality, it is almost certainly impossible (and is certainly cost-prohibitive) to build a flood-protection system around New Orleans that is truly “hurricane proof.” If the Corps would heed the advice of Park et al., they would of course take pains to protect the city from flooding, but would also invest in resilient infrastructure designed to weather inevitable flooding disaster. The example I offer though concerns social resilience. Specifically, the Corps’ collective “engineering mindset” motivated it to solve a physical problem without thought of the non-physical costs of its activities. In short, I am inclined to think that the rising tide of resilience-oriented systems (both social and physical) reflects a positive step in the development of disaster management and mitigation techniques and theories. The work of Park et al. (2013) offers a cogent and accessible case for resilience, and is well worth reading for individuals interested in disaster and emergency management – perhaps especially from a political perspective. Park, J. et al. 2013. “Integrating Risk and Resilience Approaches to Catastrophe Management in Engineering Systems.” Risk Analysis 33(3): 356-367. Hatcher, Laura J., Logan Strother, Randolph Burnside and Donald Hughes. 2012. “The USACE and Post-Katrina New Orleans: Demolitions and Disaster Clean-Up,” Journal of Applied Social Science 6(2): 176-190. Aguirre, B.E. 2007. “Dialectics of Vulnerability and Resilience.” Georgetown Journal on Poverty Law & Policy 14(1): 39-59.